Carbon Capture and Storage: Adequately Demonstrated? EPA claims carbon capture and storage (CCS) is the “adequately demonstrated” best system of emission reduction (BSER) for new coal-fired power plants. Is it? “Adequately demonstrated” roughly means commercially viable. In its so-called Carbon Pollution Standards rule for new fossil-fuel power plants, finalized last October, EPA repeatedly sites SaskPower’s Boundary Dam 3 project in Saskatchewan as evidence CCS technology is ready for prime time. Superficially, Boundary Dam 3 looks like an ideal candidate for CCS technology. “Hundreds of years of coal reserves are buried under the ground nearby, virtually eliminating transportation costs.” The project “received a major Canadian subsidy.” It has a 10-year contract to sell captured CO2 to Cenovus Energy, which injects the gas underground to extract “tertiary” oil from older wells — a process known as enhanced oil recovery (EOR). One shutdown last year cost the company C$17 million, and repeated shutdowns have forced SaskPower to miss CO2 deliveries to Cenovus. The penalties totaled C$7 million, canceling out most of the C$9 million in sales. On top of that, the carbon system is a voracious consumer of the electricity generated by Boundary Dam, which has 150 megawatts of capacity. [SaskPower CEO] Mr. [Mike] Marsh testified that about 30 megawatts of capacity were consumed by the system, and an additional 15 to 16 megawatts were needed to compress the carbon dioxide. Tim Boersma, the acting director of the energy security and climate initiative at the Brookings Institution, said that extensive power loss is a significant factor keeping other utilities from following SaskPower’s lead. So much for the gory details. Let’s consider the big picture. If partial CCS is not the “adequately demonstrated” best system for reducing CO2 emissions from new coal power plants, then EPA’s “Carbon Pollution” rule is unlawful. That rule is the legal prerequisite for the agency’s existing power plant CO2 regulations, the so-called Clean Power Plan (CPP). The CPP, in turn, is the biggest single policy component of President Obama’s emission-reduction pledge — the U.S. “Intended Nationally Determined Contribution” — under the Paris climate treaty. Consequently, if courts overturn the “Carbon Pollution” rule, the CPP would arguably fall as well, undermining confidence in U.S. “climate leadership” and the credibility of the Paris Agreement. The CPP has severe legal problems of its own, which is why the Supreme Court in February put a stay on it and numerous state governments, trade associations, and non-profit organizations are suing EPA to overturn it. However, even if the Power Plan had no internal legal flaws, it would still be illegitimate if the prerequisite regulation, the “Carbon Pollution” rule, is invalid. 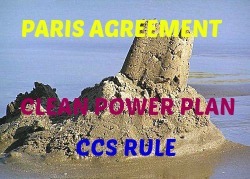 The ongoing travails of Boundary Dam 3 are evidence CCS is not adequately demonstrated, hence the rule is invalid. SaskPower officials claim “the setbacks are typical teething problems associated with any new and complex technology,” as the Times reporter puts it. Maybe so. Nonetheless, Boundary Dam 3 points to more fundamental problems. First, no utility-scale CCS power plant has ever been built without substantial subsidy. How then can CCS be adequately demonstrated? Second, even with subsidies, the commercial viability of CCS power plants depends on the opportunity to sell their captured CO2 to companies engaged in EOR. That too should invalidate the “Carbon Pollution” rule. As my colleague William Yeatman discovered, when oil extracted via EOR is combusted, it emits more CO2 than was injected underground to coax the oil to the surface. Based on Department of Energy and EPA data, I calculate that, on a life cycle basis, CCS combined with EOR emits about 1.4-2.6 tons of CO2 for every ton stored underground. In commercial practice, a CCS power plant emits more CO2 than does a conventional coal power plant. Section 111(b) of the Clean Air Act, the ostensible statutory basis for the “Carbon Pollution” rule, requires that new source emission standards reflect the adequately demonstrated best system of emission reduction. Far from being a “best” system of emission reduction, the most economical (or least uneconomical) application of CCS technology — carbon capture combined with enhanced oil recovery — actually increases emissions. Next post: Paris Climate Agreement: What Should a Republican President Do?